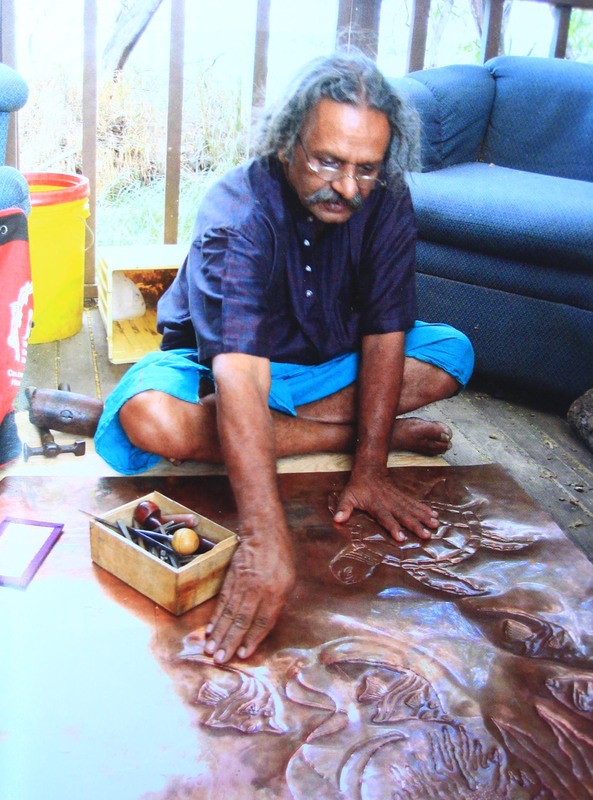 Through many years traveling overland on foot, across and from India to Europe and back again eight times, Sooriya learned the sacred art of copper from many gurus and teachers to become a world renown master copper artist and sculptor. I was born in a small village in Sri Lanka, and grew up with a great love for all kinds of art. For 35 years I have worked in the mediums of copper, iron, stone, wood, and other materials to create artworks that are as functional as they are beautiful. My artistic gift is one that comes from a long lineage of traditional techniques as well as from spiritual discipline. When I create my custom artworks, I mediate and chant while I am working, and this practice helps me to bring out a kind of sacredness in my art. All my tools I make myself by hand, and with these instruments I create all my artwork by pounding, tapping, and shaping 3-dimensional forms into copper panels. With great dedication, patience, and love, the feeling of the art comes first through my heart then flows into my hands and finally out into the piece of art. My art is always a reflection of my inner journey and an expression of great joy to share with others. I came to Hawaii 30 years ago to continue my quest to produce this kind of art, and it is here that I have developed my own unique path toward spiritual fulfillment. Your art work is incredible and what you do for others brings glory to God! God gave you a beautiful gift & a beautiful heart. I’m so glad I met you. May God bless you & your business and all you do for Him.